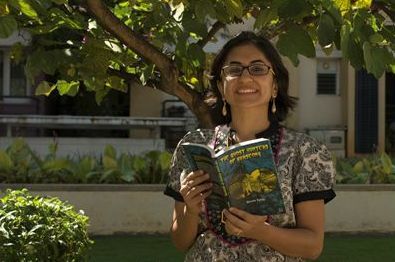 Shweta Taneja is the author of The Ghost Hunters of Kurseong (Hachette India), The Skull Rosary (Holy Cow Entertainment) and Krishna: Defender of Dharma (Campfire Graphic Novels). The Skull Rosary has been nominated for The Best Writer and The Best Cover in the Comic Con India 2013 awards AND Krishna: Defender of Dharma has been named as a must read in CBSE School (India) Reading List for 2013. Learn more about her here. NAW- Tell us about the book, The Ghost Hunters of Kurseong. What is it about?How did you get the idea for it? 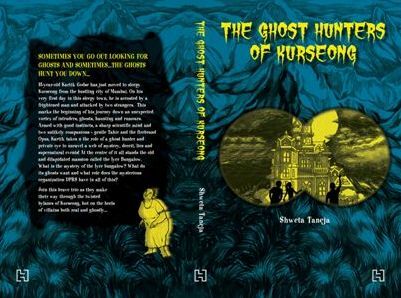 The Ghost Hunters of Kurseong is my first novel, though I have written two graphic novels before this. The book is about this boy, Kartik Godse, who shifts from Mumbai to a small town in West Bengal (he thinks it’s in Europe at first, which is what many kids thought when I asked them during detective workshops I did across the country). Now he is convinced that he will get superbly bored there, but as soon as he enters, he meets a stranger and then his mother is attacked. Both of these things are connected to the mysterious Iyer ghost who lives in the Iyer bungalow on top of a hill. The whole town of Kurseong is scared of this ghost and Kartik decides to solve the mystery about this ghost. During his adventure which takes him through politics, media, ghost hunters and irritating adults, he makes two really good friends: Opus and Tashi who help him out in this. Whether the ghosts are real or not keeps you turning pages till the very end! I first imagined The Ghost Hunters of Kurseong as a graphic novel which is why the scenes, setting and the descriptions are so vivid and visual. The plot developed as a graphic novel which I wanted to pitch to a particular publisher. Unfortunately (or maybe fortunately) that project fell through. At that time, I was working on a research project with the Centre of Internet and Society, Bangalore. The three kids of the book kept on haunting me, wanting me to write down their story. They do that, the characters, once born, they never let you be till they have been written about. Like tantrum-throwing children. So I decided to write their story as a novel. The other novel that I was working on at that time, a fantasy book, wasn’t working out anyway. I gave myself a deadline of six months to write the first draft and six more to edit it into something that would satisfy me. And then I pitched it to eight publishers, directly without any agents. I was slightly crazy, yes. But I was also really, really lucky. The publisher I wanted the most, Hachette India picked it up first and made it into this beautiful book you see today. When nearly-13-year-old Kartik Godse’s mother informs him that they are to move from Mumbai to the small hill station of Kurseong, he thinks that he will die – of sheer boredom. However, he couldn’t be more wrong. On his very first day in the sleepy town, he is accosted by a frightened man and attacked by two strangers. And so begins a spiral down an unexpected vortex of intruders, ghosts, hauntings and rumours. Armed with good instincts, a sharp scientific mind and two unlikely companions – gentle Tashi and the firebrand Opus – Kartik takes on the role of ghost hunter and private eye to unravel a web of mystery, deceit and supernatural events! At the centre of it all stands the old and dilapidated mansion called the Iyer Bungalow. What is the mystery of this house? What do its ghosts want and what role does the mysterious DPRS have in all of this? Join this spunky trio as they make their way through the twisting bylanes of Kurseong, hot on the heels of villains both real and ghostly . . .
NAW- How did you start writing in the fantasy genre? What drew you to it? Any favourite authors that have inspired your writings? Ever since I remember,I have always been fascinated by both the thriller/mystery genre as well as everything that is paranormal and supernatural. On summer nights in Delhi (I grew up there), when electricity would go off, I would make my cousins sit around me and create ghostly stories to tell them, younger or elder. You can say all kids love horror stories, monsters and dragons and demons. I guess I grew up but the kid in me never did. I am still fascinated by everything supernatural and paranormal. That’s what you will find on my desk, on my shelves, movie collection and blogs I have subscribed to. I think mostly I am interested in combining the paranormal with the mystery genre. To keep my readers (and myself) guessing, to add surprises at every turn! The series I am working on now is about a female tantric detective based in Delhi. My fascination for ghosts and monsters and aliens becomes more real because for me, they represent the ‘others’ in a society. In our society, which is mainstream human, they are the monsters, they are the evil or the unknown factor, they represent our fears, our hopes, our nightmares. I imagine them as different species with completely different rules, languages, clothes, behavior, faces and lifestyle. Because we as humans don’t understand them, cannot put them into neat little, controlled boxes, we are scared of them. Or we shun them, or have strong opinions for or against them. We dismiss them out of hand saying they don’t exist, we think of them as evil, bad news, we even try and destroy anything supernatural they might face, either physically or ideologically. But none of us approach the others without some preconceived notions. Which is why I find recreating them and their worlds in my novels so fascinating. It’s like most of us have so many opinions about say North Koreans and have never visited them or met anyone from that country! While exploring their world – the world of paranormal and supernatural, I also change both as a writer and as a person. I see things in my own world differently, transform and end up understanding other’s point of views much better. And I think I have also become a better listener! I have many favourite authors who have inspired me and who continue to serve as an inspiration. There’s one thing I have learnt till now. To be a writer, you have to be a varied reader. Though I have read many in the genres I love the most—fantasy, science fiction and mystery/thriller, I also try to read as much of other genres as possible. I call it my learning period, where I go through authors works, learn from the way they write, express, use language, build stories. My ever favourites, the ones who I go to when I am completely dried up creatively are: Terry Pratchett, Neil Gaiman’s Sandman series, Sherlock Holmes, Shakespeare (Macbeth, A Midsummer Night’s Dream), Kahlil Gibran (The Prophet), GRR Martin, Wodehouse, Raold Dhal, Samit Basu, and many more! You already know about my debut novel,The Ghost Hunters of Kurseong (Hachette India). That was released in September 2013. It’s a mystery set in the small town of Kurseong for youngsters and has gotten great reader and media reviews. My two other published works include a mythological graphic novel Krishna: Defender of Dharma (Campfire Graphic Novels) and a dark take on Shiva, The Skull Rosary (Holy Cow). I have also edited Digital AlterNatives With a Cause? (Centre for Internet and Society), a book on how youngsters use internet for social change. And written shorts for Celebrate Holi! (Hachette India) and Were House-House of Horrors (Holy Cow). NAW- Tell us about your journey as a writer. I started my career as a writer 12 years ago as a journalist and an editor and chased stories for media stalwarts like Couture Asia, Femina, Men’s Health, Mint, Time Out, World Wide Media, Images Business of Fashion, Good HouseKeeping, Discover India and Elle. I have written more than 200 articles on health, technology, women’s issues, fashion, beauty and continues to write features for HT Mint, Maxim, Discover India, and Citizen Matters.In 2009 however, I discovered that creating stories is much more fun than chasing them. The end result was that I chose to transform into an author. It took me a whole year of doing nothing, of failing to write a book and constant procrastination. Since 2009, I have written four books and continue to write a new urban fantasy series, based around a female tantric detective. In spite of the listing above, I think my journey as a writer has just begun. There is so much I want to learn! So much I want to explore, through my words, through my mind, through my stories. Ideas are pure when they are in your mind, but to bring them on paper, through words, takes quite a lot of talent and I have just begun to hone my skill. Every day, I read, my favourite authors as well as new authors to learn how they use language to express ideas. That’s essential in my journey. I have also learnt in the past five years to take criticism and failure in my stride. To not stop at each ‘No’ or rejection and feel demotivated. When you put something out there that’s creative and new, there are people who will like it and there are people who won’t. You just have to let it be and not take it too personally. Otherwise, the fear of criticism will stop you from creating. You have to remain positive everyday, every moment to keep creating. And never think you will just have good days. Most of the writing I do, I know that I have to delete the next day. But I still have to write it wrongly to get to the right way to writing it. Don’t ask me why that happens, but it feels that failures are important to find success as a writer. That’s one of my most important learnings till now. I binge on fantasy shows, kungfu anf Bollywood movies. I love to sink in the fantasy and science fiction genre and can’t get enough of mythology, especially its darker tantric side. To take a break, I take long walks in an agricultural college next to my home. To see plants and trees slowly change, season by season, reminds me a little of how my novel is building up, day by day. I also love to see how birds go about their business, on time, repeatedly, everyday, without any complaints (unlike us humans!). I relax by swimming and doing a round a yoga. That helps clear up my mind for new ideas to float in. I also like to do gardening, chat with people on weird or normal topics and have tea. I have a secret cha-bar at home with atleast 15 types of tea to choose from everyday. I need a cup of that to start writing! NAW- How do you write, planning the complete plot beforehand or do you let the book take its course? Take us through your writing process. It’s a mix of both. I make a sketch of the plot, writing down the scenes on little chits of papers, to see that each plot point is seamlessly finished and there are no hanger ons, since I mostly write detective books. After I have a sketch, I put it down in a linear document and start writing. But it’s not a complete plot and my novel doesn’t always stick to the ‘plan’ so to say. It changes, morphs, converts, meanders and gets lost in the woods. So yes, I do have a sort of a plan when I begin but then when I am writing, this plan kind of goes all awry, like all life plans do and sometimes takes me in a different direction. So that in the final book, all you see is a shadow of the plot I had first created. 1) Nine Lives William Dalrymple: These are nine first-person perspectives of a Buddhist monk, a Jain nun, a tantric, a Theyyam dancer, an illiterate goat herd and a temple prostitute. Well researched and mesmerizing in its lyrical travel writing. I travelled 500 kilometers to see a live Theyyam performance after this book! This high fantasy series has broken down all the conventions laid by Tolkien and his likes. And brilliantly, I must add. The fantasy is realistic, its characters juicy, always on the edge of death, in a cruel and violent world. A comic book series, Sandman chronicles the adventures of Dream, the Lord of Dreaming, a mythical land of dreams and nightmares. The series deliciously mixes real life incidents with folk tales, mythology of ancient Greek, European and Indian cultures. Combines inspiration, brilliant storytelling with a complex layer of references. Power, corruption and colourful characters in Delhi’s political and government corridors. Delhi Durbar, part of Raisina Trilogy by Singh is brilliantly plotted and written with a bite. Unexpected, outrageous and sometimes hilarious turn of events will keep you turning this one! Jaya is a retelling of Mahabharata and includes regional and folk variants to the classical Sanskrit text. Devdutt who has written many articles as well as books on Indian mythology gives a fresh take to the epic with comments that draw attention to variations in the story, the rituals and customs that may have emerged from the story and are practiced even today. The information is written well and quite insightful. NAW- What are you working on next? 2013 saw the release of my books: The Ghost Hunters of Kurseong and The Skull Rosary, which is a graphic novel on the darker side of Shiva. Currently, I am working on a series about a tantric detective based in Delhi. This is an urban fantasy that plays around Anantya Tantrist, a gutsy tantric detective who walks in Delhi at night, solving supernatural crime and mysteries. Through Anantya’s world, I am trying to explore more on the concept of ‘others’ – the supernatural creatures who are misunderstood, abused and lie on the edges of what is considered civilization. The Anantya Tantrist series explores the filthy supernatural underbelly of modern Delhi. Harper Collins will be bringing out Book 1 of this series, called The Cult of Chaos in the end of 2014. I am currently writing Book 2. Read an excerpt from The Ghost Hunters of Kurseong here.